TUESDAY (6).—The visitors to Buffalo Bill's Wild West show in the evening were treated to an unrehearsed incident. About six o'clock a large boiler full of fat was boiling on the stove in the cowboys' kitchen, when suddenly the vessel tilted, and the building, which is a timber one, was in flames. 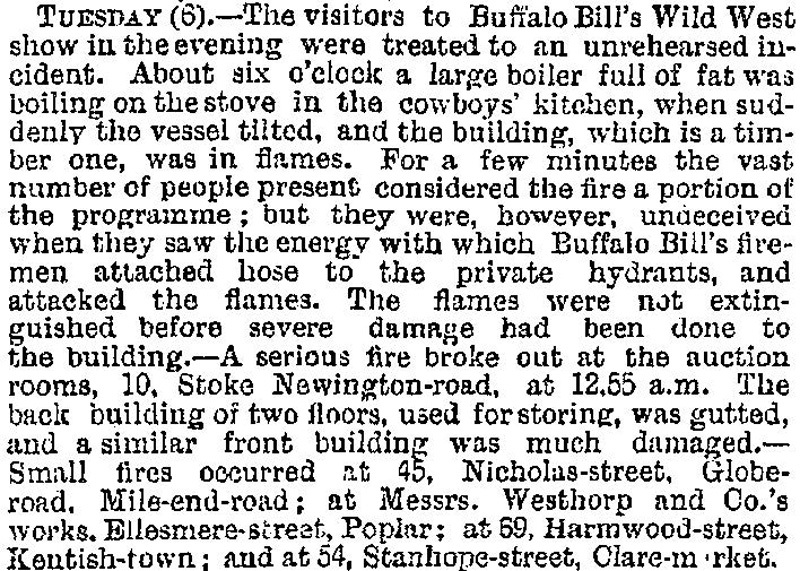 For a few minutes the vast number of people present considered the fire a portion of the programme; but they were, however, undeceived when they saw the energy with which Buffalo Bill's firemen attached hose to the private hydrants, and attacked the flames. The flames were not extinguished before severe damage had been done to the building. 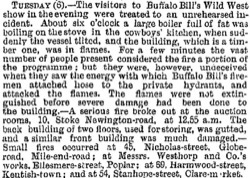 —A serious fire broke out at the auction rooms, 10, Stoke Newington-road, at 12.55 a.m. The back building of two floors, used for storing, was gutted and a similar front building was much damaged.—Small fires occurred at 45, Nicholas-street, Globe-road, Mile-end-riad ; at Messrs. Westhorp and Co.'s works. Ellesmere-street, Poplar ; at 59 Harmwood-street, Kentish-town; and at 54, Stanhope-street, Clare-market.